Freeman (ankle) isn't practicing Wednesday, Nicki Jhabvala of The Athletic reports. Analysis: Freeman is less than two weeks removed from suffering a high-ankle sprain in a Thursday night game against the Cardinals. Another absence in Week 9 would leave more work for Phillip Lindsay and Devontae Booker, both of whom were productive in Sunday's 30-23 loss to the Chiefs. The Broncos will host the Texans this weekend. Freeman (ankle) won't play Sunday against the Chiefs, Nicki Jhabvala of The Athletic reports. Analysis: With Freeman out this weekend, look for Phillip Lindsay to see added carries Sunday, while Devontae Booker's change-of-pace upside figures to see an uptick Week 8. Freeman (ankle) did not practice Thursday, Jeff Legwold of ESPN.com reports. Freeman (ankle) wasn't on the field for the start of Thursday's practice and will likely go down as a non-participant in the session, Nicki Jhabvala of The Athletic reports. 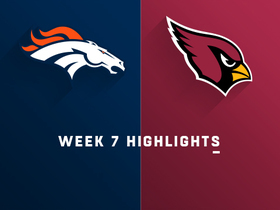 Coach Vance Joseph labeled Freeman (ankle) as day-to-day in the aftermath of the Broncos' 45-10 win over the Cardinals on Thursday, Kyle Fredrickson of The Denver Post reports. Joseph is hopeful Freeman will be able to play Week 8 against the Chiefs. 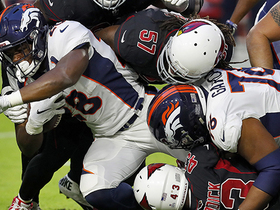 Freeman suffered a high-ankle sprain Thursday in the Broncos' 45-10 win over the Cardinals and will require an MRI, Ian Rapoport of NFL Network reports. Analysis: While high-ankle sprains are typically concerning injuries, Rapoport notes that there's "early optimism" about Freeman's outlook and adds that "it's no guarantee that he misses time." 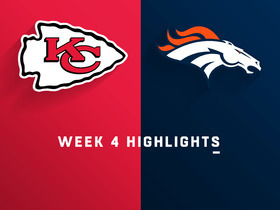 Working in Freeman's favor is that the Broncos don't play again until Oct. 28 against the Chiefs. Denver should issue an update on Freeman's condition after the MRI is completed, but if the rookie does end up missing game action, additional opportunities would be in store for backfield mate Phillip Lindsay. Freeman sustained a sprained ankle in Thursday's 45-10 win over the Cardinals, Adam Schefter of ESPN reports. Analysis: Freeman seems as though he could be sidelined for a bit, considering Mike Klis of 9News Denver labeled the rookie's injury as a high-ankle sprain. 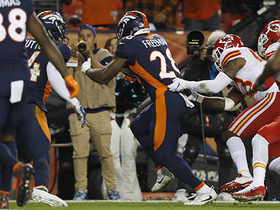 The Broncos will hopefully offer an estimated return timetable for Freeman within the next couple days as they evaluate his injury, but at this point the 22-year-old's status for Week 8 at Kansas City appears to be in some peril. Freeman is out for the remainder of Thursday's contest with an ankle injury, Nicki Jhabvala of The Athletic reports. Freeman carried the ball nine times for 22 yards during Sunday's 23-20 loss to the Rams. Analysis: Freeman ended Sunday with a stable-high 25 snaps but finished with a season low in yardage thanks to a Broncos offense that ran the ball on just 28 percent of snaps. The Broncos' young backfield is talented, but early deficits and long third downs have held them in check. Thursday's game against Arizona's 20th-ranked run defense at 4.4 yards per opponent carry could be an elixir. Freeman rushed for 31 yards on five carries and added 16 yards on three catches during Sunday's 34-16 loss at the Jets. Coach Vance Joseph acknowledged Wednesday that he plans to involve Freeman more heavily in the offensive game plan in the weeks to come, Kyle Frederickson of The Denver Post reports. "I'm looking forward to getting [Freeman] more touches," Joseph said. "He needs more opportunities because he is playing good football." 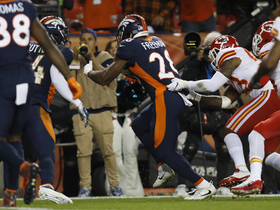 Freeman rushed eight times for 67 yards and a touchdown in Monday night's 27-23 loss to the Chiefs. Freeman rushed for 53 yards and a touchdown on 13 carries and added a five-yard catch during Sunday's 27-14 loss in Baltimore. 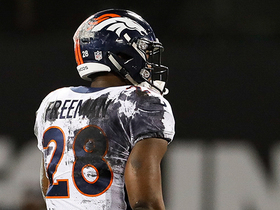 Freeman rushed eight times for 28 yards and a touchdown in Sunday's 20-19 defeat of Oakland. He failed to catch his only target. Analysis: Freeman drew the start and struggled to begin the game, gaining just two yards on three carries over the first two quarters. 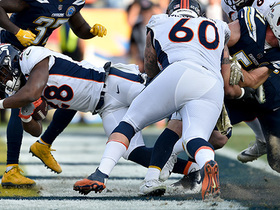 He was fortunate to cap off the opening drive of the second half with a one-yard touchdown run, but Phillip Lindsay outperformed his teammate on the whole and saw almost double the touches. The 22-year-old will try to be more effective Week 3 at Baltimore. Freeman ran 15 times for 71 yards and did not catch a pass in Sunday's 27-24 win over Seattle. Freeman will be the Broncos' top back heading into Week 1. Freeman will not play in Thursday's preseason finale against the Cardinals, Kyle Fredrickson of The Denver Post reports. Analysis: Freeman, who will finish his first preseason having carried 15 times for 84 yards and three touchdowns over three games, will rest in advance of the Sep. 9 regular season opener. The rookie running back has been a major bright spot for the Broncos in training camp, and while it looks like he will be splitting work with Devontae Booker to start the year, more performances like the ones he has put forth this preseason would earn him a lion's share of the backfield soon enough. Broncos head coach Vance Joseph de-emphasized the importance of labeling Freeman or Devontae Booker as the team's starting running back Tuesday, stating that either back could be on the field for the first play of the season opener depending on the play call, Zac Stevens of BSN Denver reports. 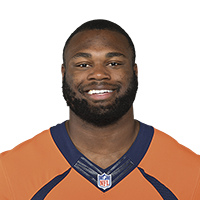 Coach Vance Joseph said Freeman will play in Thursday's preseason game against the Cardinals, Troy Renck of Denver 7 News reports. Freeman took five carries for 26 yards and a touchdown in Friday's preseason game against Washington. Freeman rushed six times for 20 yards and one touchdown during Saturday's preseason game against the Bears. Analysis: Freeman continued to split first-team work with Devontae Booker, and the rookie continued to outshine his counterpart en route to Freeman's second rushing touchdown in as many games. It'll be interesting to see how the Broncos dole out snaps during the team's third preseason game next Friday against the Redskins, when the starting offense is expected to get it's longest run of the preseason before presumably sitting out the preseason finale. Freeman had four carries for 38 yards, including a 23-yard touchdown, in Saturday's preseason loss to Minnesota. Analysis: Devontae Booker got the first carries with the offense, but Freeman outplayed him as Booker had just two carries for seven yards. While Freeman's touchdown came later in the game against the second-team defense, his performance will put pressure on Booker in the battle for the starting job. Freeman is listed as a second-stringer on the Broncos' preseason depth chart, Nicki Jhabvala of The Athletic Denver reports. 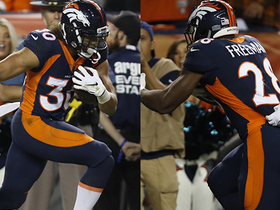 Analysis: Freeman is predictably nestled between Devontae Booker and De'Angelo Henderson, with the Broncos giving a nod to Booker's status as the veteran of the young trio. The rookie out of Oregon still has plenty of time to make his push for the lead job, starting with Saturday's preseason opener against Minnesota. Freeman will push Devontae Booker for the Broncos' starting running back job, ESPN.com's Jeff Legwold reports.